For many years, musicians have been looking for decent ways of hosting, embedding, distributing and selling music online. The shops that sell MP3s, on the back of iTunes success, are myriad. 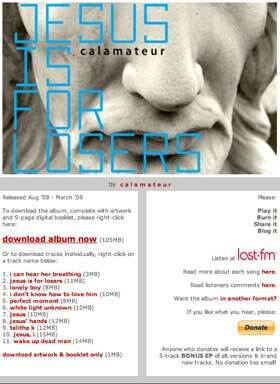 As are the sites that let you upload a few tunes and put them on your profile, ala Myspace, Reverbnation etc. But two services are now becoming essential in the web-savvy musicians tool-kit – BandCamp and Soundcloud. Most of the research I’ve seen – as well as the conversations I’ve had – tell us that a reasonable percentage of people still buy CDs. They still want music on CD, and are going to buy the music they like. Since Radiohead and Prince ‘gave albums away’ last year, we’ve all been talking endlessly about whether or not all music should be ‘free’, whether this is the new model that we should all adopt. Two things are clear about Radiohead, Prince and Trent Reznor – (1) they’re all massively wealthy, and (2) all could guarantee massive press coverage for a move as ‘bold’ as giving a record away. From those two points, I think it’s easy to see why modeling our marketing strategies against these artists is a non-starter. Unless you’re independently wealthy, or have the kind of day-job that affords you both the time and resources to tour heavily to symbiotically promote YOU via the free downloads and the tour, there’s not really a comparison financially. And as anyone knows who’s ever paid for print advertising, column inches are incredibly valuable – the value of the coverage that Radiohead got for ‘giving their music away for free’ must’ve run into millions of pounds worldwide – a new Radiohead album is frontpage news in Q and Spin, but not in all the national newspapers around the world that covered it as a lead story, or on the television news programmes that led with it. Musicians are following suit, taking at face value the idea that Radiohead, NIN et al. gave away their music for ‘free’ and not looking at the massive value it carried as a press-generator for them in a way that just doesn’t work if you haven’t already had millions spent on you over years and years to get you to the place where your ‘free’ album is front page news. Clearly, me ‘giving my music away’ and Radiohead ‘giving their music away’ are not comparable situations. Not at all. For one thing, I’m a solo bass player. In a world where ‘pop’ music is driven by two main things – singing and drumming – I play instrumental music without a drummer, often without a fixed rhythm at all. Copying the broadcast-focussed actions of a bunch of zeitgeist-defining millionaire pop-stars is about as useful to me understanding my audience as putting videos of me reading Shakespeare on Youtube would be, just because a lot of people like Shakespeare. Getting sidetracked by the aspiration to be a rock ‘n’ roll superstar is career suicide for an artist still needing to generate an audience to be monetized. I’ve said it before, and I’ll say it again, in the new music economy, any strategy that relies on Broadcast media but doesn’t have millions of dollars to invest to get that rolling is doomed to failure. Yes, there’s the chance that something you ‘give away’ will ‘go viral’. There’s also a chance that you’ll win the lottery and be able to pay for all that lovely broadcast airtime you so crave. Neither happen anywhere near frequently enough to be statistically significant when planning how to build an audience and connect with them. No, we need to think differently, and the bit that we do have control over is the conversation. The back-and-forth with our audience, our friends and our peers about what we do and why we do it, framing out art in a dialogue about what it is, why it exists and the ways that people who like it have to support it. That’s what social media presents us with. I can answer in-depth questions about what I do on the forum, I can invite comment about what I do, here on the blog via comments, I can answer one-line questions and field comments about gigs via twitter, creating a buzz about it amongst those people who get to hear about it. So am I anti-free? Clearly not, the gig was essentially ‘free’, for most of the audience, but it was a different kind of free. It was free with context, free with value, in that everyone who was put on the guestlist was grateful, came with a sense of excitement and expectation, and went home talking about the gig. The music became a social object, something with value and cache, all of which is there to be monetized at a later date. The gig, the music and my relationship with the people there was framed within the context of a series of social media-enabled conversations. I’m not suddenly going to fill Wembley by doing this, but the desire to fill Wembley is a destructive greedy pipe dream that ignores the beauty and value in where my music, career, and relationship with my audience is at NOW. I may one day fill Wembley, but I may also one day meet a benevolent billionaire on a plane who decides to sponsor my music to the tune of £200,000 a year, expecting nothing in return. Neither are a good plan to base a marketing strategy on. So, forget about the mis-use of the word ‘free’ as applied to the ‘music in exchange for press coverage and gig promotion’ that already-successful multi-million-selling Rock stars do, and start focussing on the conversation you can have with your audience, using your music as a social object around which to build value, cache, excitement, events and value added product/scarcity-based revenue streams. “And nothing but the bass! No, don’t be afraid, you are not likely to get bored just because a single instrument takes the spotlight in this recording; in fact you will have the opportunity to discover a new world of sounds and colours conjured up by the intelligent use of the bass, which is perhaps too often written off as being unable to play an important role, except where it deals exclusively with rhythm. On the other hand, without going into the greats of the instrument in the fields of jazz and jazz rock, how can we forget the fundamental role played in rock by bassists such as Jack Bruce, Chris Squire, Mark King and Tony Levin? How can we ignore how many new horizons have been opened up by the courageous souls who have dared to abandon the “pedal” on the bass strings to venture in search of new possibilities on the high strings? What would Gentle Giant have been like with the bassist from AC/DC in the line-up? And the Clash with Stanley Clarke? But, without losing ourselves completely if “ifs” and “buts”, you get the picture that Steve Lawson is a bassist who belongs to that group of musicians who consider the bass to be an instrument capable of breaking new ground in its own right. His approach has been praised by colleagues of the calibre of Michael Manring and Danny Thompson. Steve Lawson began his career as a solo performer when a London dance company commissioned him to write music for a contemporary dance performance which was subsequently held in a car park in central London. He then took part in the National Music Shows in 1997, 1998 and 1999 at the Wembley Conference Centre and held various clinics on the use of effects, MIDI and real-time sampling. Twitter-peoples: welcome to my e-world, dive right in! OK, so you arrived here via my twitter page, and want to know more? Short version – I’m a musician, music teacher/lecturer, 1/5th of New Music Strategies, writer and social media tinkerer. I blog about my music life, specifically the various things that are now possible for musicians thanks to the joys of ‘tinternet. I’m also a consultant/thinker about Social media in a wider context, particularly as it relates to creatives. I co-run a social media event help organisation called Amplified. Your best places to start finding out what I do are my blog (set aside a while, there’s a lot of it! ), and the music pages. It’s worth having a listen, honest, cos all this other nonsense is related to the music – that’s the centre of the wheel, the hub around which all the other stuffs rotates. After that, you might want to find me elsehwere: Facebook, Last.fm, YouTube and some other places. You’re also welcome to check out the gigs page in case I’m out and about. If you followed me in the hope that I’d follow back and I haven’t, it’ll be because of two things – firstly, I don’t get notifications of new followers – there were too many, and it was taking up loads of time. I do go and have a look about once a week to delete all the spam and wrongness, so then I follow people I know. Downloading made easy, the Reverb Nation Widget way! 1. click the word ‘songs’ at the top of the widget. 4. while the track is playing, click the little download arrow to the right of the play-timeline, underneath the tracklist. Then repeat steps 2 and 4 – click on each song and click download. And you’ll have a shiny digital loveliness copy of LLfaAF Pt II. One of the fun things about doing this experiment with the free downloads has been listening back to two albums I’ve not listened to of mine for a long time. LLfaAF Pt II is the record where I fell in love with my fretted 6 string bass – The majority of the tracks on it are recorded with that bass. Melodically, it’s probably the most ‘jazz’ thing I’ve done, as I was quite consciously experimenting with more ‘outside’ lines and some bigger intervals in the melodies. It was nice to go back and rediscover a few things I was doing then that I haven’t done since, and am now wanting to reincorporate into my playing. For those of you who are musicians wanting to make your music available in different places, Reverb Nation widgets are a great way to do it – if you go to my page and click on the widgets tab, you’ll see all the ones available. You can even make the one above the main music interface on your blog. It’s a good way to manage collecting mailing list subscriptions in exchange for the free stuff, rather than just giving it away AND having to play for the bandwidth from your own server. 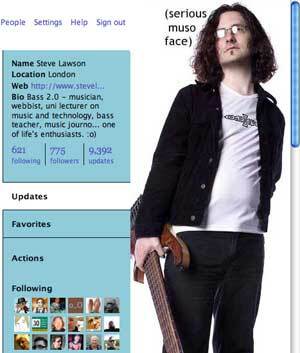 And of course, your legions of fans can include your widgets on their myspace page, blog, facebook page, bebo page. etc etc. As the user-base of Reverb Nation grows, it may increase in native currency. For now, it’s largely about traffic you send to your page, and the widgets it makes available. Though the nice thing about it being pretty small right now is that I’m at Number 2 in their jazz charts! 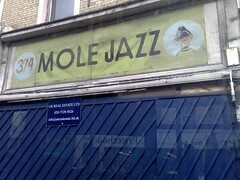 – that’s 2nd out of 1789 ‘jazz’ artists. And that’s without even being proper jazz. Good work.